The Paintings of Monica Aissa Martinez are an intricate blend of science, alchemy, myth and magic. Her work recalls both the naive compositions of folk and primitive art and the delicate renderings of the painter Paul Klee. Born in El Paso, Texas of Mexican-American descent, Martinez was raised in a traditionally Catholic environment that exposed her to the rituals and symbols of the Church and the religious folk art of Mexico. She is drawn to small devotional paintings known as retablos and ex-votos, and has adapted the iconography, palette and graphic qualities of this naive art to create her own form of narrative paintings. She displays a strong kinship to the women artists of the Surrealist movement, especially Remedios Varo and Leonora Carrington. Varo and Carrington, noted for their haunting portrayals of the subconscious, based their work on individual experience and translated their personal realities into boldly imaginative paintings. Like these women Martinez's paintings reflect a serious exploration of her interior life. Much of her work stems from curiosity about such diverse subjects as religious practice, anatomy, physiology, physics and ancient myth. Drawing from these sources she combines and adapts many of the parallels she observed to formulate her own answers to larger questions about the nature of the universe. élan vital (literally 'vital ardor'), the exhibition's title, refers to the term elaborated by the French philosopher Henri Louis Bergson (1859-1941). In his book Creative Evolution, Bergson defines élan vital as "the creative force within an organism that is able to build physical form and to produce growth and necessary or desirable adaptation." For Martinez, the term makes broad reference to her underlying philosophy about life and the process of making art. Martinez's belief that all living forms are created out of a persistent natural force is the focus on her current body of work. In her paintings, the artist explores the physical and spiritual qualities of the feminine psyche through metaphors associated with the body. Generously-shaped flasks, bottles, vases, and other decidedly female vessels are reminiscent of ancient carvings of fertility goddesses. Figures are usually centered, precisely balanced, with a multitude of appendages and trees emerging from the tops of their heads. 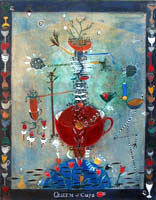 Many pieces appear to be autobiographical and titles such as What am I? and I am That reflect the artist's personal quest. A number of works are patterned after the Tarot, a deck of allegorical cards representing the four basic forces of nature (earth, air, fire, water) and the morality of mankind. In The Queen of Pentacles, 1996, Martinez mixes magical signs like the pentacles (a five pointed interlocking star) with symbols abstracted from science creating a figure with goddess-like significance and power. As in her other work, the body is represented by a container-a bountiful vessel in the shape of an over-ripe pomegranate. Seeds tumble from the figure's torso and sprout, branching and blooming around her. Martinez's compositions are filled with energy. She creates laboratories of activity-places where cups and cauldrons of mysterious concoctions bubble and overflow their edges, spit and simmer releasing ribbons of encoded messages and symbols into the air, uniting mind, body and spirit. Nothing is in stasis; Martinez is the magician/alchemist striving to distill impurities and transmute her subjects into gold, creating alternate worlds of cosmic scope and microscopic intimacy. Monica Aissa Martinez studied at New Mexico State University in Las Cruces and earned her Master of Fine Arts degree in 1991. She lives and works in Phoenix, Arizona.